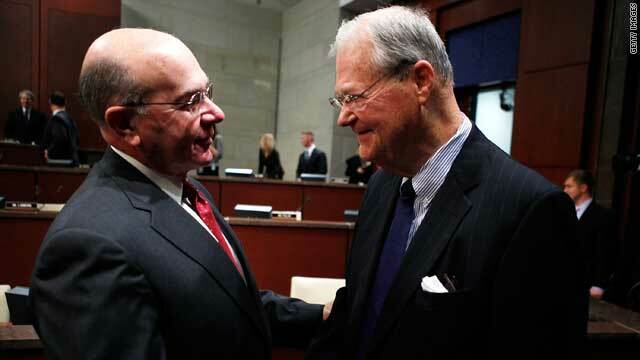 Retired Navy Adm. Vernon Clark, left, talks with Rep. Ike Skelton, chairman of the House Armed Services Committee. Washington (CNN) -- Members of Congress focused on the Army's soldier-performance review and promotion process Wednesday, questioning the chief investigators behind a Pentagon report examining November's shootings at Fort Hood, Texas. "This guy was a walking time bomb," said Rep. Loretta Sanchez, D-California, referring to Maj. Nidal Hasan, an Army psychiatrist and the alleged shooter in a rampage that killed 13 people and wounded 43. Sanchez and other members of the House Armed Services Committee questioned Togo West Jr., former Army secretary; and retired Navy Adm. Vernon Clark, who explained their review of the shooting. Committee members asked about issues surrounding the incident, including protection for soldiers on base, emergency response policies and efforts to recognize soldiers exhibiting erratic, radical or violent behavior. But many on the committee wanted to know specifically about the Army's performance evaluation process, including whether performance reviews are watered down in an attempt to shift problem employees elsewhere. I am particularly concerned about the system of officer evaluation in the Army and other services. "I am particularly concerned about the system of officer evaluation in the Army and other services," said committee chairman Ike Skelton, D-Missouri. "The performance reports ... must accurately reflect the strengths and weaknesses of officers. Problems must not be passed from one assignment to another." Hasan was promoted to the rank of major in May despite weak performance reviews and reports that he was becoming increasingly radical. Sanchez acknowledged that one of the most difficult things about being a manager is firing or demoting employees and dealing with subsequent legal issues. "It doesn't make any of us feel good," she said. "We tend to move them on." Sanchez said including poor performance reviews in a soldier's file can have far-reaching implications, and managers often consider "how much you can damage the career of someone who has made the military their career." Like other committee members, she asked the panel about military constituents who have sought psychological help, only to have their careers negatively affected by doing so. Clark paused before responding. "I wish to goodness that I was not constrained from talking about this," he said, referring to the classified parts of the report he wasn't allowed to discuss publicly. Hasan's commanders "were responsible for developing him and educating him and training him in the field of medicine, and as an officer in the United States Army. Our impression -- and the words in our report are as straightforward as we can say them -- it needed work." West, who is also a former secretary of Veterans Affairs, sympathized with the difficulties commanders face when writing performance reviews. He described what basically amounts to a fine line between "damaging careers with hasty judgments," or conversely, simply passing off a sub-par employee. He said there's "tension" for commanders regarding when to act on information versus when not to, and what should be passed along versus what shouldn't be. But, he said, "Evaluations make a difference, and we can't do the job of leading or protecting against threats if honest evaluations are not done by those who have the duty, the information, and the authority to do so."